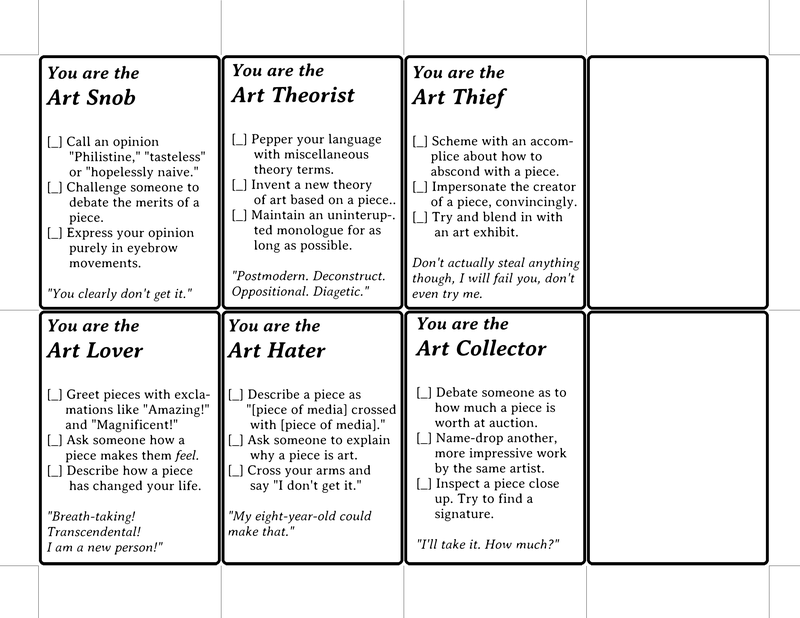 The Art Crowd is an alternate reality social experiment for art shows. It was originally designed for the opening of a curated exhibit on games, digital and otherwise (Hey! Play! at Chicago Design Museum, 2017). I later refitted it to run in my Games Literacy class -- it was great for getting my students over the hurdle of vocalizing their reactions to art and starting discussions. I'm making it available as a free teaching tool. 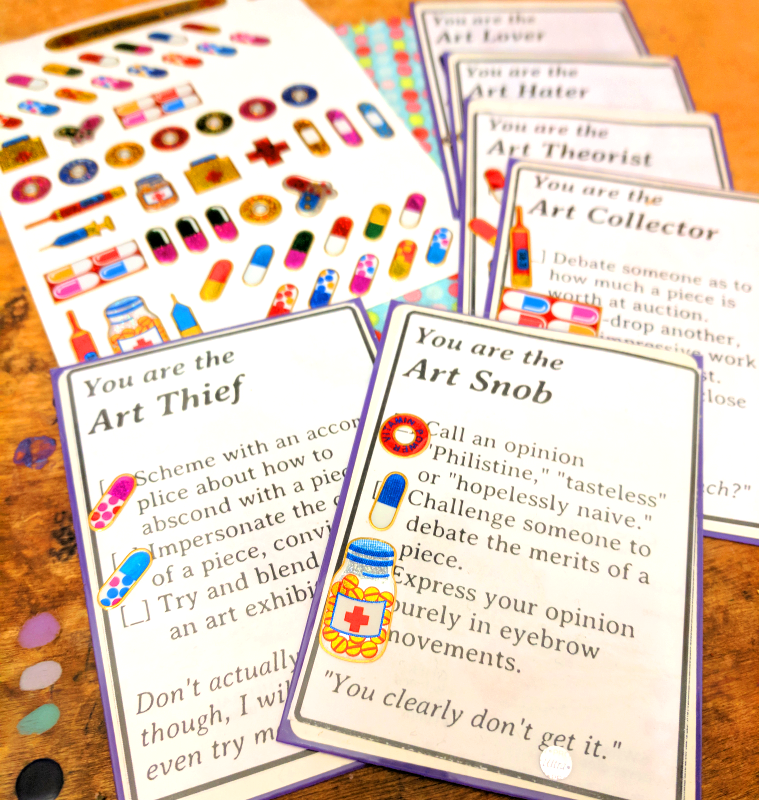 Participants are given one of six roles: The Art Lover, Art Hater, Art Theorist, Art Snob, Art Thief and Art Collector, and set loose in a gallery space. Each role has three tasks associated with it. Players collect stickers by performing those tasks. I've had the most success running this with small groups, where group members can bear witness to and reward each other's portrayal of their characters. Download either the Open Office format or the preformatted cards. Cut the cards on the lines, then use card protector sleeves and spare playing cards to make them sturdy and durable. This video will show you how. There are six different archetypes. I ran this game with groups of five to six students, giving each a set of six cards and a sheet of stickers. It's okay if all six roles aren't covered in a group. The one absolutely critical rule is: You cannot give yourself a sticker. As the tasks are designed to generate discussion, it's important that the tasks be performed in front of others. In my class, I also ask students to curate the art show. Each group is asked to curate one section of the a group exhibit, providing whatever artworks they're showing. Pieces can be of any medium -- Students frequently bring visual art, digital work, sometimes audio work, sometimes conceptual exhibits or historical displays. As a group, they write and submit an Artist Statement. The Victoria & Albert museum's Design/Play/Disrupt show (2018), which exhibits digital games alongside more traditional artworks. Famously, they presented Kentucky Route Zero alongside Rene Magritte. Discussion question: What does that juxtaposition invite the viewer to consider? Babycastles' Maze show (2012), which installed digital maze games within an actual, physical maze. Discussion question: What if anything does it add to these games to be presented the way they are -- in an actual maze? Exhibiting Difficult Games, a blog post by Matheson Marcault. This list of strategies really demonstrates how important framing is to presenting work, and how curators use physical space to shape how viewers encounter the work. On the day of the art show, students meet and are given time to set up their exhibits. Then I had out materials for the Art Crowd, intro the game, and have them perform a gallery walk with their groups. Each group will receive role cards and stickers. Everyone should have a role. You can divide them up however you want. It's okay if some roles don't get used. When your groupmates observe you performing an action listed on your card, they can put a sticker on your card. You cannot give yourself a sticker. Sorry! Try and fill your checklist! 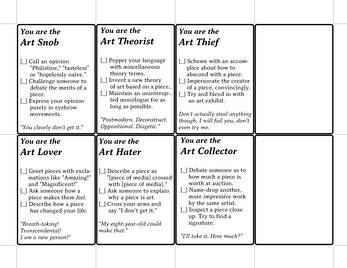 Some of the roles (Art Hater, Art Snob) encourage you to act a little mean, but don't be hurtful mean. Make sure to respect your classmates' feelings! Who had an easy time inhabiting their role? Who had a challenging time? Did you find yourself saying things you agreed with, or disagreed with? What pieces surprised or confused you? Why did you have that reaction? What were some interesting juxtapositions between works? Were any really jarring to see next to each other?